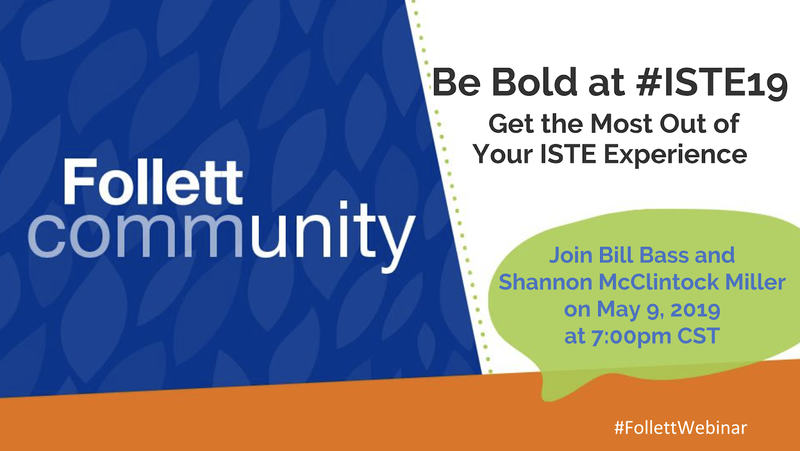 The Library Voice: Be Bold At #ISTE19....Join Bill Bass & I For This NEW Follett Webinar! Be Bold At #ISTE19....Join Bill Bass & I For This NEW Follett Webinar! It's hard to believe that ISTE 2019 is right around the corner. Before we know it, thousands of educators will be gathering in Philadelphia for this amazing conference, which is always one of our favorites. As we get ready for ISTE 2019, my dear friend and colleague, Bill Bass, and I are getting together for a new Follett webinar on May 9, 2019 to share how to get the most out of your ISTE experience too. Whether it’s your first time attending ISTE or if you’ve been before, it’s smart to plan ahead so you explore wisely, understand what not to miss, and determine exactly what you want to garner from the conference. There are myriad new and innovative practices waiting for you in Philadelphia, along with immeasurable ideas and connections to be made. As we get ready for this summer’s conference, the key is be ready, and these two experienced educators and seasoned ISTE veterans will share what they’ve learned as attendees, informed by their specialized experience. Information on the Future Ready Librarians even, which takes place on the Saturday before ISTE begins. ISTE special events, keynote speeches you should take in, all from the perspective of this year’s ISTE Board of Directors President. Specifics on the ISTELibs breakfast. Tips for managing time and energy during the conference. What first-time attendees can expect, and ideas for having the best experience possible. What not to miss on the exhibit floor. Things to see in Philly in your spare time (and maybe where to find the best Philly cheesesteak). We hope that you join us by visiting this link and signing up. It is going to be a great way to kick off this time before ISTE and to make connections with a whole lot of other librarians and educators before we all go to Philly too.